Greenway in Devon is a beautiful woodland garden set on the banks of the River Dart. It is most famous for being the summer home of Torquay born Mrs. Mallowan, better known as the author Agatha Christie, the Queen of Crime. She certainly is one of the most popular novelists in history. 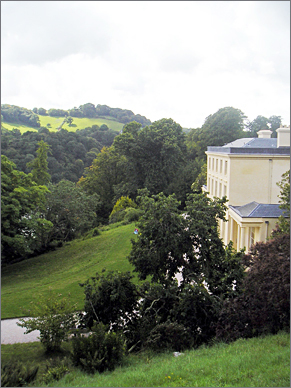 The gardens are set within a large estate and offer splendid views over the Dart Estuary. Greenway garden is renowned for its timeless and private feel. Wild flowers thrive under and between hardy perennial planting. Today it is estimated that Agatha Christie has sold over 2 billion novels, 1 billion in the English language and 1 billion in 45 different translations. Together with her second husband, Max Mallowan an archaeologist, she bought the estate of Greenway in 1938 and she loved to spend her summers there. The estate was gifted to her daughter Rosalind Hicks who, with her husband Anthony, maintained the gardens of Greenway giving the impression of being ‘held on the edge of wilderness until donating them to the National Trust in 1999. The gardens at Greenway are full of varied delights including walled gardens, flat lawns, wild herbaceous borders, hidden water features, woodland walks and a fine nineteenth century boathouse. Christie fans can gain a taste of how Dame Agatha lived and other visitors can simply soak in the secluded, ‘secret garden’ feel and admire the views. In a career spanning half a century Agatha Christie wrote over eighty novels and short stories. Her first novel The Mysterious Affair of Styles (1920) featured perhaps her most famous detective, Belgian detective Hercule Poirot and her last published novel, Sleeping Murder (1976), Miss Jane Marple of St. Mary Head, her second most famous detective. Her 1939 novel, And Then There Were None (1939), is the best-selling novel in the world. She is famed for being scrupulous for always making it possible for the readers to solve the mystery themselves. Christie also penned a dozen plays, one of which, The Mousetrap, opened in London on November 25th 1952 and is now the longest running continuous play in theatrical history. Under the name Mary Westmacott, Agatha also published six romantic novels and under her own name she published four non-fiction books including an autobiography and a collection of memoirs from the archaeological digs of her second husband. Her novels and plays have been adapted into countless feature films and TV series. Her general view of interpretations of her characters was poor, but she was said to be fond of the 1974 feature film Murder on the Orient Express. 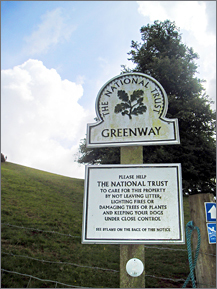 The National Trust try to retain the ‘wild feel’ of the Greenway gardens that has been slowly created over hundreds of years, but especially by Rosalind and Anthony Hicks. The Hicks’ loved plants from the southern hemisphere, cultivating many species and selling them through the nursery. Today this legacy can be seen in the numerous magnolia, camellia, hydrangeas, rhododendrons and shrubs. They were also patrons of art, donating sculptures that are integrated into the garden. A Japanese bronze statue of the Garden of Mercy, Kwan yin can be found at the Kwan Yin Pond surrounded by camellia, buddleia and rhododendrons, the Greenway bird can be found placed at the Bird Pond and a statue by Bridget McCrumm, The Mother and Child can be found relaxing in a field of cyclamen repandum and narcissi. Visitors begin at the walled gardens, one of which is home to a vinery dating from the 1830s. The other is the centre of the garden’s current propagation work and the largest peach house in Devon. Above the walled gardens is The Top Golf Lawn, one of Agatha’s favourite places with fine views stretching over her house and the valley. Just aside from the lawn there is a lavish Victorian fernery, a particular favourite of Anthony Hicks. The top garden was originally a nursery, with terraces running down the hill towards the magnificent views of the Dart Estuary. These have now been lawned, but a new border has been planted against the wall at the top of the garden. The ‘hot’ theme dictates the use of bright plants that leave no ground uncovered, including delphiniums and geraniums. Walks through aged woodland and black bamboo lead to the riverside and the Victorian boathouse. Agatha Christie sat and wrote here, even setting the murder of Marlene Tucker here in the Poirot mystery Dead Man’s Folly (1956). You can even sit in cane furniture purchased by Dame Agatha herself! The boathouse is also nicknamed ‘Drake’s Boathouse’ by locals, the site possibly being associated with the sixteenth century sea-faring adventurer. Below, a Victorian plunge pool designed to fill with water, provided a refreshing swim for its Victorian designers. Further on from the boathouse, a ruined brick aviary and greenhouse sits in the National Trust’s largest camellia garden. Greenway provides the perfect setting in which you can use your imagination to link a garden with one of its former owners and enjoy the same spaces and views they enjoyed a generation ago. Travel to the site by ‘Greenways’ is actively encouraged and those who choose to travel this way can be offered reduced ticket prices. Shop: A National Trust shop is on site. Plant sales are available. Tea Room/ Restaurant: A licensed café serves homemade light meals, locally produced organic and vegetarian food. A children’s menu is also offered. WC: Yes, including baby-changing facilities. Parking: There is free parking 550yds from the entrance. All cars must book parking space but this can be done on the day of visit. Mini coaches (25-seat maximum) only. Four disabled spaces are available 100 yards from the entrance. Seats and benches: Plentiful throughout the gardens. A picnic area is provided by the car park. Average visitor duration: 1 and a half hours. Accessibility – in the park/ garden from the car park: The grounds are partly accessible for wheelchairs and a map of the accessible route can be provided. Some paths are steep and slippery so access can be difficult. There is limited access for personal mobility vehicles. The paths at the lower levels of the garden are steep, rocky and rooty, particularly around the boathouse, and are inaccessible to those hard of walking and in wheelchairs. There is a ramped entrance into the café and a large print menu is available. There is a ramp to the upstairs of the Barn gallery. For the visually impaired a Braille guide and a large print guide are available. Dogs must be kept on leads on main drive to visitor reception and café courtyard only (not in garden). There is a dog park in shade outside reception with water available. Dogs can be taken on walks through the estate but must be kept on leads when farm animals are present. Children’s programme/ events or other educational activities: Children’s quiz/trail. ‘Meet the Gardener’ guided walks, £1.50pp – Fri 2pm; booking essential, numbers are limited. Ferry: Visitors are actively encouraged to enjoy a cruise on the River Dart from Dartmouth. They are advised to use the Dartmouth Park & Ride (a bus service arrives ever 15 minutes) allowing at least four hours of parking. Riverlink service from pontoon adjacent to Station Restaurant (01803 834488) Dittisham Ferry from North Steps (01893 833206) Ferries are available for individuals, groups and charters. There is a steep walk uphill (800 yards) from Greenway Quay to the garden. By train: Paignton is four and a half miles from Greenyway. Churston (Paignton & Dartmouth Steam Railway) is two miles from the site. On foot: The Dart Valley Trail from Kingswear or Dartmouth, the Torbay Dart Link from Brixham and the Village Walk from Galmpton all pass the garden. By road: Follow the A3022 between Paignton and Brixham and look for brown signs for both Greenway Ferry and the Gardens when you turn into Galmpton. From Galmpton the gardens are well signposted. No parking is available on the road roads around the garden so you MUST book a parking space. Without one, you will be turned away. When booking, an alternate route might be suggested to you through the country village of Stoke Gabriel. DO NOT follow this route. The roads are both poorly signposted and very narrow. Any small gains you might make in time are negated by the awkwardness of the route.